Few cities in America have as many charms as the southeastern coastal towns of Charleston and Savannah. From history and culture to world-class cuisine and the great outdoors, these two southern charmers have something for everyone. There are few better ways to first explore a town than with a tour. Both cities have varied tours and many visitors choose to take more than one during their time there. Charleston: Tour Charleston is owned and operated by locals Julian and Polly Buxton. Their company offers a variety of history- and ghost-based tours. 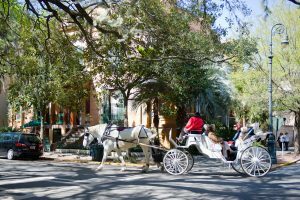 Other city tour possibilities include: varied horse and carriage tours; Bulldog Tours; Gullah Tours; and Gray Line of Charleston. Savannah: Old Savannah Tours offers hop on and off trolley tours that provide a great overview. 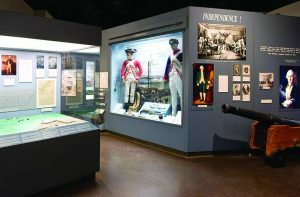 The tours feature historic reenactors, so tour-goers might get to “meet” Forrest Gump, a pirate from the historic Pirates’ House, or even Georgia’s founder, James Oglethorpe. Along with other trolley tours, other tour options throughout the city include: Architectural Tours of Savannah; the Paula Deen Tour; Hearse Ghost Tours; and Authentic Savannah Ghost Walks & Hidden History. Food has become such an integral part of travel that people are choosing destinations for restaurant bucket lists, food and beverage festivals, and other food-focused experiences, including culinary tours. What better way to immerse yourself in a culture and people than through its food. Charleston: Charleston Culinary Tours dishes up a menu of five culinary experiences, each offering a unique bite of the city. Along with other food-oriented tours, beverage-focused tours of Charleston are also numerous, including distillery tours, brewery tours, and pub crawls (like The Original Pub & Brewery Tours of Charleston). Savannah: Savannah Taste Experience Food Tours features a “First Squares Food Tour,” which offers tastes and tours of historic downtown restaurants and eateries. It’s a perfect first-timers choice, with tours and tastings in the historic downtown district. Visitors won’t go thirsty in Savannah either, thanks to Savannah Pub Tours and other thirst-quenching touring options. Charleston and Savannah are both steeped in history and locals love to share it with visitors on the streets, on tours, in restaurants, and—especially—in several history museums. 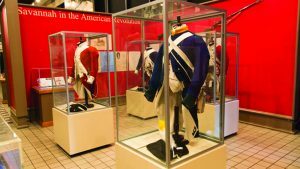 Charleston: The Charleston Museum has an extensive collection that presents the history of the Lowcountry from early southern culture to decorative arts, military, and natural history. Other historic possibilities include: many historic houses and mansions; the Postal Museum; the Old Slave Mart Museum; and the Confederate Museum. Savannah: Savannah History Museum is the perfect place to head for an overview of Savannah’s fascinating history. Other options include: the Georgia State Railroad Museum; the American Prohibition Museum; and the Mercer House Carriage Shop & Museum. Both cities feature a great mix of historic and contemporary art in varied museum settings that provide further insight into life there today and in the past. 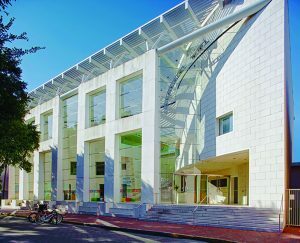 Charleston: Gibbes Museum of Art focuses on the art and history of the Lowcountry through painting, miniature portraiture, sculpture, photography, and more. Other artsy Charleston possibilities include: City Hall Gallery; the Halsey Institute of Contemporary Art; and the Karpeles Manuscript Museum. Savannah: The Telfair Museums comprise a trio of Savannah museums that include the Telfair Academy (the oldest public art museum in the South), Jepson Center (a world-class contemporary art museum), and the antebellum Owens-Thomas house. In addition, the SCAD Museum of Art is part of the acclaimed Savannah College of Art and Design and is a major part of the thriving arts scene in the city. Charleston features many historic homes downtown and renowned plantations nearby, while Savannah’s historic homes overlook equally historic squares. Charleston: Several of Charleston’s historic homes are open for tours, including the Calhoun Mansion. Though pretty Magnolia Plantation & Gardens is the state’s most-visited plantation, the plantation possibilities around Charleston include Boone Hall, Charleston Tea Plantation, and Middleton Place. Savannah: The Federal-style Davenport House Museum was completed in 1820 and saving it in 1955 was the first such effort by the Historic Savannah Foundation. There’s also the Andrew Low House, the Juliette Gordon Low Birthplace, and others. There’s also Wormsloe Plantation, with its oak-lined drive and Spanish moss dripping from its trees. Both cities have lots of parks and other green space to enjoy. Charleston: Marion Square is at the heart of downtown Charleston. It’s the location of the popular Charleston Farmers Market, the Charleston Wine + Food Festival, and many other Charleston happenings. Other spots with green space include: Charleston Waterfront Park and Charles Towne Landing. 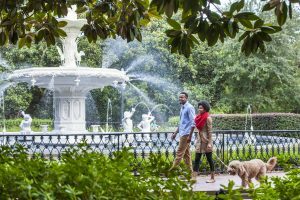 Savannah: Sprawling Forsyth Park, with a classic fountain, stays busy with walkers and runners, bikers, and live music lovers. Designed as a city of green space, lots of additional acres of green can be found in Savannah’s 20-plus squares. The coastal locations of Charleston and Savannah mean a pick of great beaches. Charleston: Folly Beach remains a visitor and local Charleston-area favorite, but the Isle of Palms, Sullivan’s Island, Kiawah Island, and Seabrook Island all have their fans as well. Savannah: Locals and visitors alike love everything about Savannah’s nearby Tybee Island, with other great beach options including Little Tybee Island, uninhabited Wassaw Island, and—just 30 miles along the coast—Hilton Head Island. From rivers, marshes, and more out to the Atlantic Ocean, both Charleston and Savannah offers many opportunities to get out on the water. Charleston: Family-owned since 1961, SpiritLine Cruises & Events features a 90-minute harbor tour that departs from downtown’s Aquarium Wharf and out at Patriots Point in Mt. Pleasant. Other water-based options in Charleston include: Charleston Harbor Tours (several boat and tour options) and Coastal Expeditions (eco-tours, boating, kayaking, and more). Savannah: Savannah Riverboat Cruises offers a wide variety of river and harbor cruises day and night, including Southern-focused lunch cruises, sunset cruises, and live entertainment. Other options include: Moon River Kayak Tours and Sundial Charters (nature and fishing tours). With something for everyone, it’s easy to shop ‘til you drop in both cities. 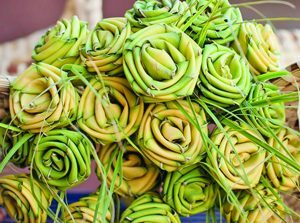 Charleston: It’s hard to top Charleston City Market when it comes to finding that perfect souvenir, thanks to more than 140 merchants in three open-air sheds and an enclosed Great Hall (look for handmade sweetgrass baskets). In addition, lots of independent shops are on or near bustling Meeting and King Streets. Savannah: Since the 1770s, City Market has been historic Savannah’s commercial and social hub. Today, the four-block area of restored warehouses and shopfronts around Ellis Square is a great place to shop, enjoy live entertainment, and dine. Both cities have “Grande Dame” hotels and inns that also offer grand dining options for non-guests in the know. Charleston: Adjacent to award-winning Wentworth Mansion, Circa 1886 features the sublime cuisine of Chef Marc Collins, one of the founders of the Charleston Wine + Food Festival. 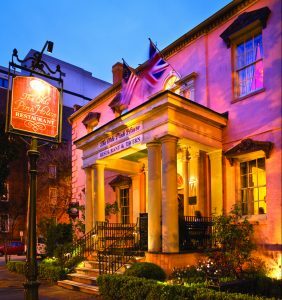 Savannah: Overlooking Forsyth Park, 700 Drayton Restaurant at the Mansion on Forsyth Park combines the history and opulence of Savannah with contemporary cuisine with a flair. They’ve mastered fine dining in the South and that’s certainly true in Charleston and Savannah. Charleston: Situated inside the Belmond Charleston Place, Charleston Grill may be the classic fine dining restaurant in Charleston. Other fine dining options in Charleston include: legendary McCrady’s Tavern (ask about Chef Sean Brock’s adjacent McCrady’s “Tasting Menu”); acclaimed Husk; Magnolias; FIG; and The Grocery. Savannah: Set in an historic Greyhound bus station, The Grey Restaurant has raised the bar of Savannah cuisine to another level. Other fine dining options in Savannah include: The Collins Quarter; The Olde Pink House (locals say head downstairs as well); and Rocks on the River Modern Grill. Dining in the South can be casual and very hands-on (think peel-and-eat shrimp). Charleston: Deluged by lots of tourists and many locals alike (including the late Pat Conroy), Hyman’s Seafood was established in 1890 and still features casual Charleston dining—with peel-and-eat shrimp and much, much more on the menu. Other casual—but delectable—dining options in Charleston include: Blossom; Indaco; Minero; and beloved Jestine’s Kitchen. Savannah: There’s nothing in America quite like Mrs. Wilkes Dining Room, where shared tables are piled with platterfuls of fried chicken, sweet potato soufflé, and more. There’s typically a line for a reason. Other casual hotspots in Savannah include: The Lady & Sons (of Paula Deen fame); Treylor Park; and fun Crystal Beer Parlor. Both cities are known for fresh local seafood and more—and the competition is stiff for seafood-loving visitors and locals in-the-know alike. Charleston: Among the dozens of restaurants specializing in seafood, The Ordinary from James Beard Award-winning Chef Mike Lata is truly a Charleston seafood palace. Other tasty options for seafood in Charleston include: Rappahannock Oyster Bar; Fleet Landing Restaurant & Bar; Coast Bar & Grill; and Bowen’s Island Restaurant. Savannah: Unique and sleek Chive Sea Bar & Lounge features Lowcountry seafood and other ingredients. Other options in the area include: Savannah River House Seafood; Chart House; Tubby’s Seafood River Street; and The Wyld. Anytime is a great time to head to either city and it seems like there’s always something for everyone on the calendar. 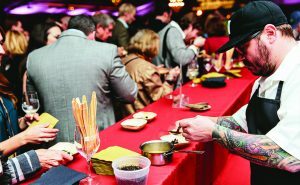 Charleston: The Charleston Wine + Food Festival has been one of America’s top food and beverage festivals for more than a decade, drawing world-class chefs and others from around the corner and around the world. Other events of interest include: the Southeastern Wildlife Expedition; Lexus Charleston Fashion Week; the Annual Festival of Houses and Gardens; and so many other events. Savannah: The Savannah Book Festival is one of America’s top literary festivals, drawing renowned authors and others. Other options include: the huge St. Patrick’s Day Parade and Celebration; the Savannah Music Festival, and much more. For the charms of Charleston, head to www.explorecharleston.com. To start savoring Savannah, visit www.visitsavannah.com. And to begin your journey, to the American South or elsewhere, go to our website, www.thousandtrails.com.